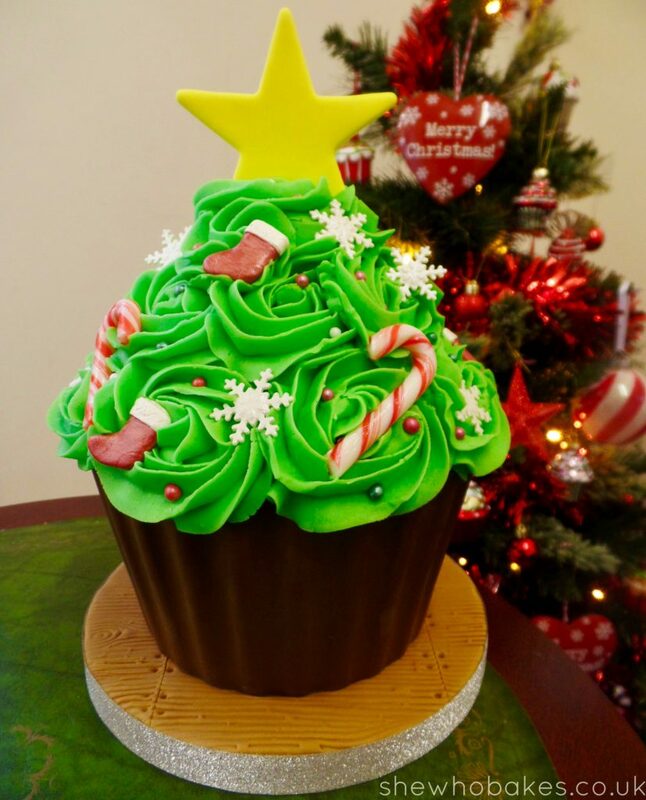 Tis the season of festive bakes and you don’t get much more festive than an edible Christmas tree! This fun cake design is easy to make and sure to impress your guests this season. 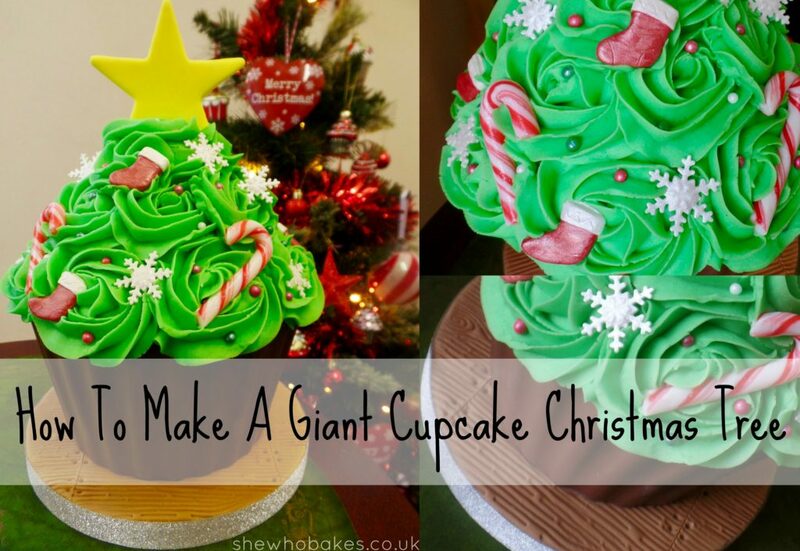 I’ve based it on a Giant Cupcake but you could easily do this with two 7″ round cakes carved to make a similar shape. For this cake, I recommend making the cake, decorations and covering the board on the first day, leaving everything to set and then coming back to stack and decorate the following day. Equipment can be purchased from Iced Jems. 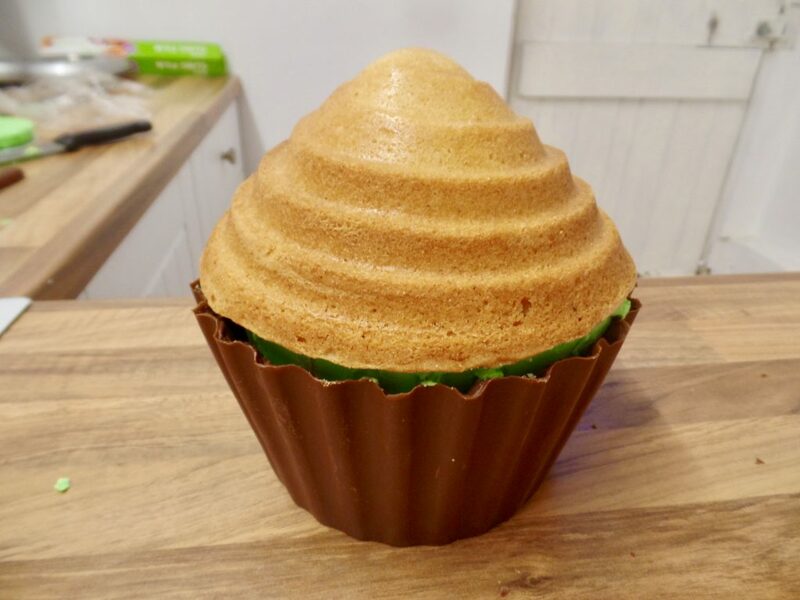 The first thing you’ll need is a Giant Cupcake, you can follow my step by step tutorial on how to make one here. I recommend making it the day before you want to decorate to give it time to firm up so it doesn’t fall apart when we are decorating. Make sure to leave it wrapped well in cling film in a cool dry room. I don’t advise decorating cakes the day you make them for this very reason. Read more about my cake timeline here. Start by colouring modelling paste yellow (if starting with white), using a concentrated colouring. 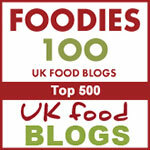 I’m using Sugarflair Melon. 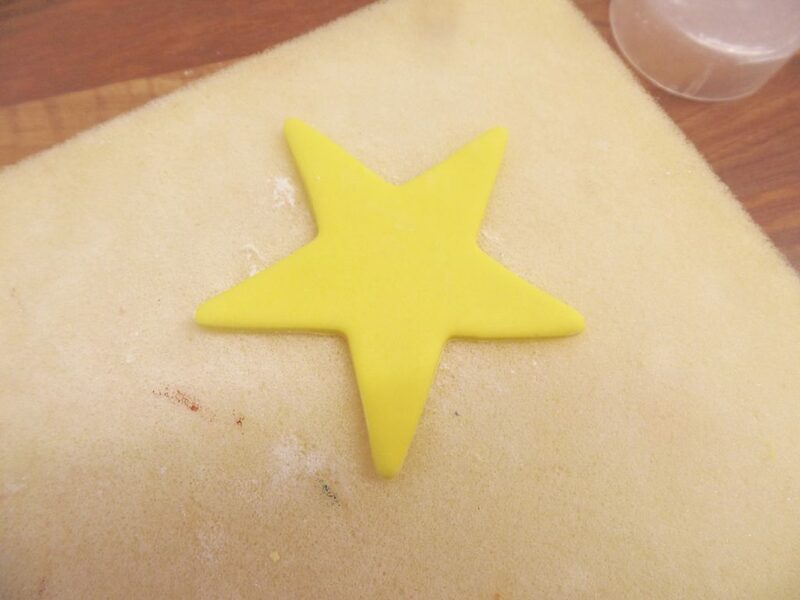 Then roll it out onto a surface dusted with cornflour and cut out a large star. Leave to dry overnight on foam. Then, go on to make any other decorations you would like. 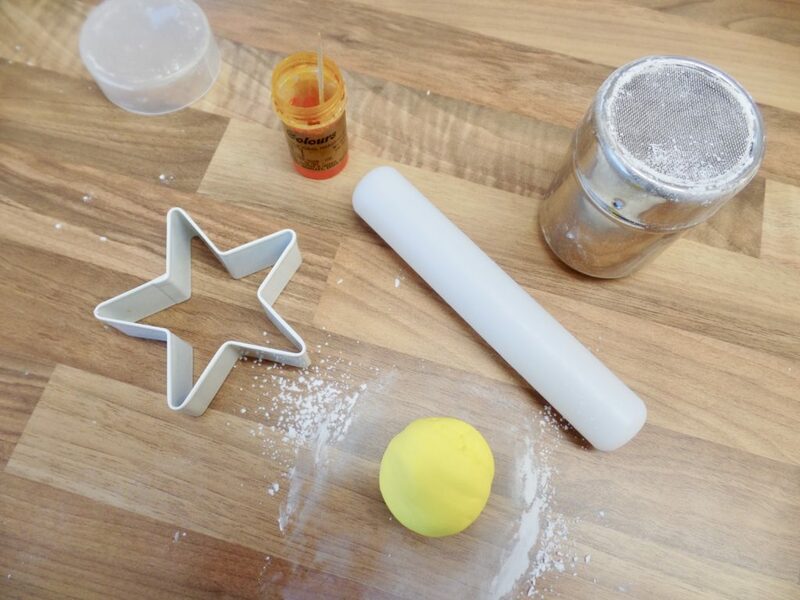 Using flower paste and a plunger cutter I have made snowflakes and using modelling paste and silicone moulds I have made small stockings which I have painted with edible food paint and I’m using small store bought candy canes. 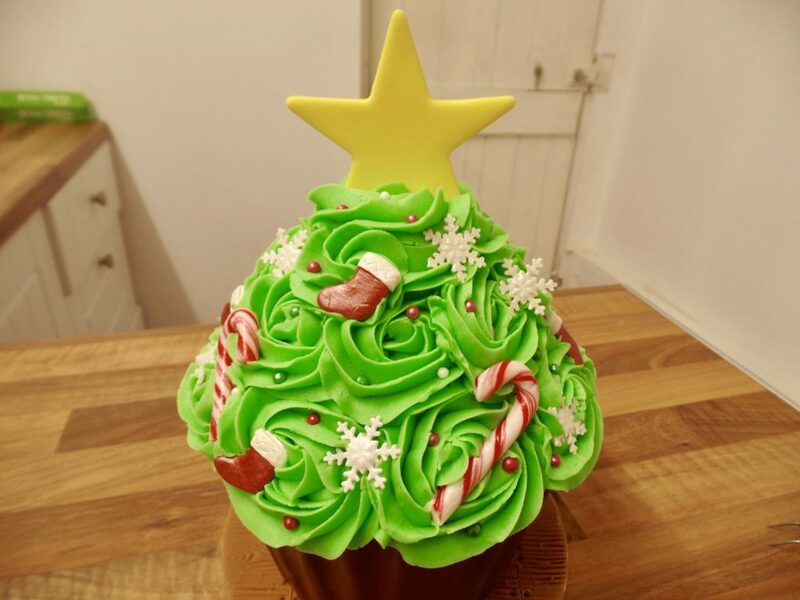 You can make whatever you like or alternatively use pre-made edible Christmas decorations readily available in cake shops and supermarkets alike. Next, we’re going to cover our board. 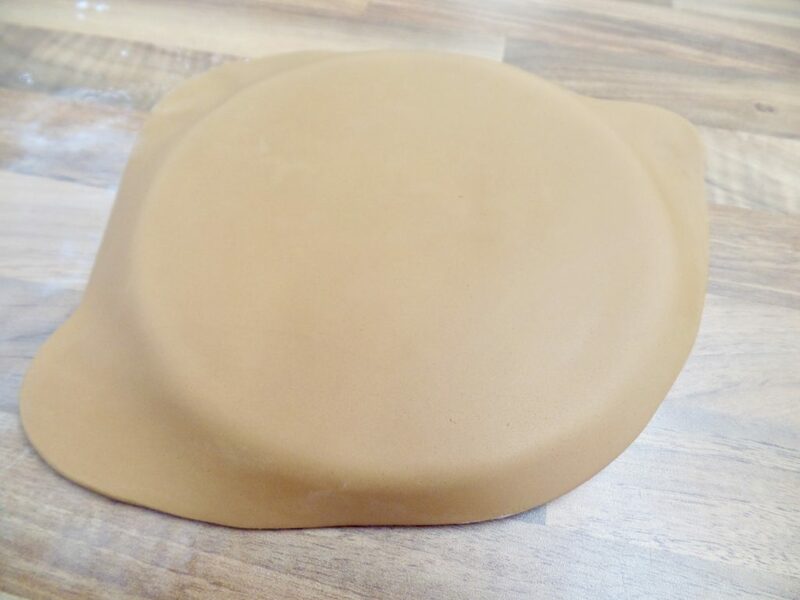 I am a firm believer in covering cake boards with sugarpaste (read more about my crusade here) as I feel it adds a professional touch to your bakes and makes them look a bit more special. So for this you will need 100g sugarpaste (ready to roll icing) in whatever colour you like. I’m using a brown as I will be texturing the board to look like wood grain. 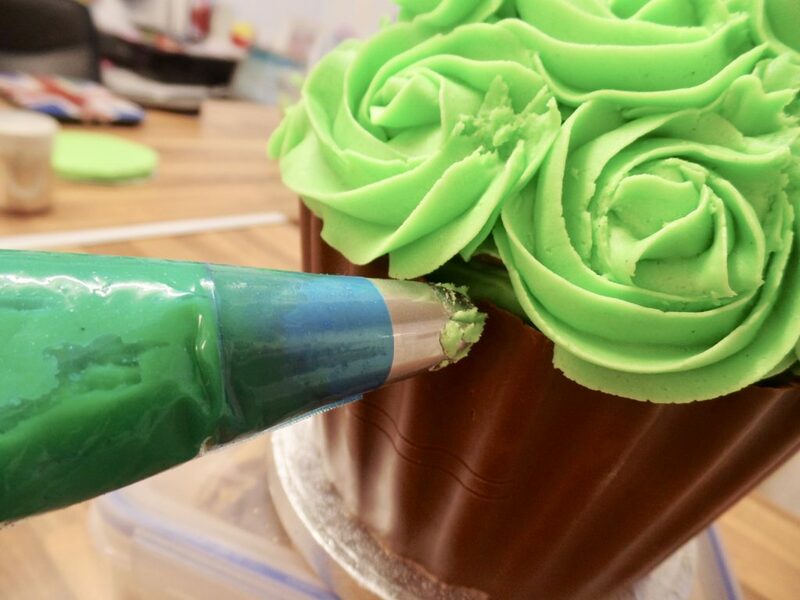 To do this, roll out your icing to 5mm thick on a corn floured surface, turning the sugarpaste as you roll to get an even shape and to stop it sticking. 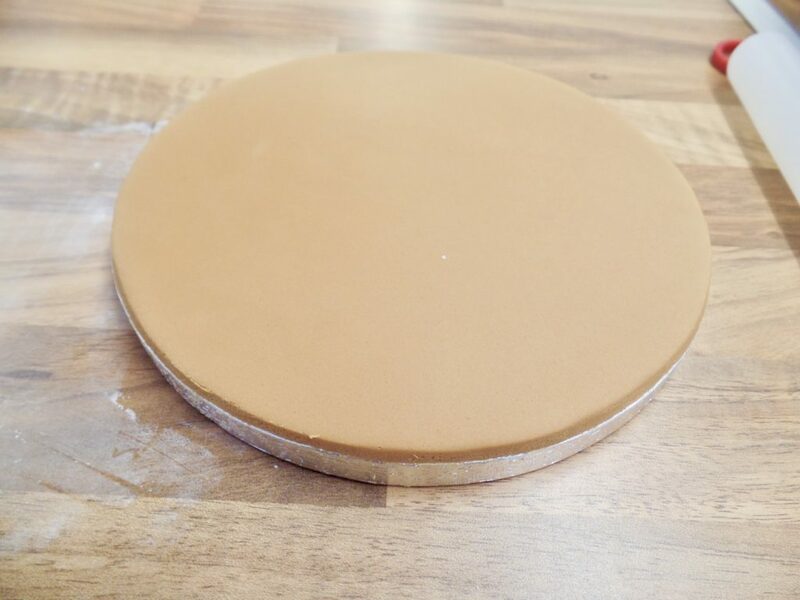 Spray your drum lightly with water and then using your rolling pin to lift your sugarpaste, lay it gently on the drum, securing it with your hand and cutting off the excess with a sharp knife. 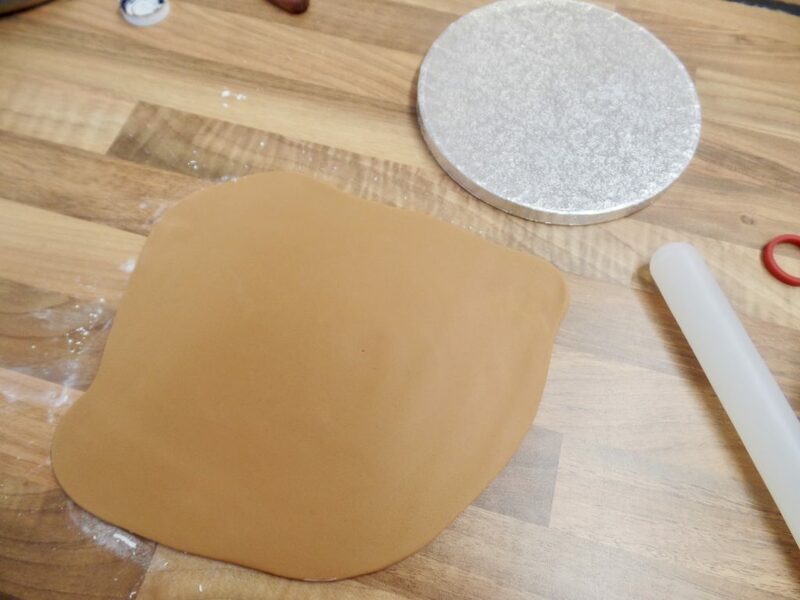 To see a video of me covering a board in sugarpaste, check out my post here. Before I leave my board to set, I’m going to texture it with a textured mat. 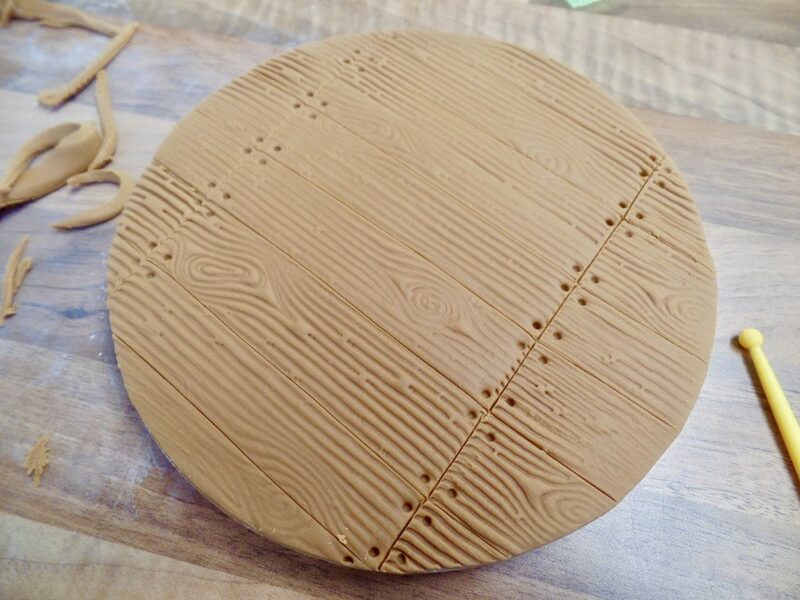 Starting at one end of the board, push the pattern onto the sugarpaste in an even fashion. Leave to set overnight. Then, using either double sided tape and 15mm ribbon or washi tape (I’ve used sparkly silver washi), decorate the edge of your cake drum. 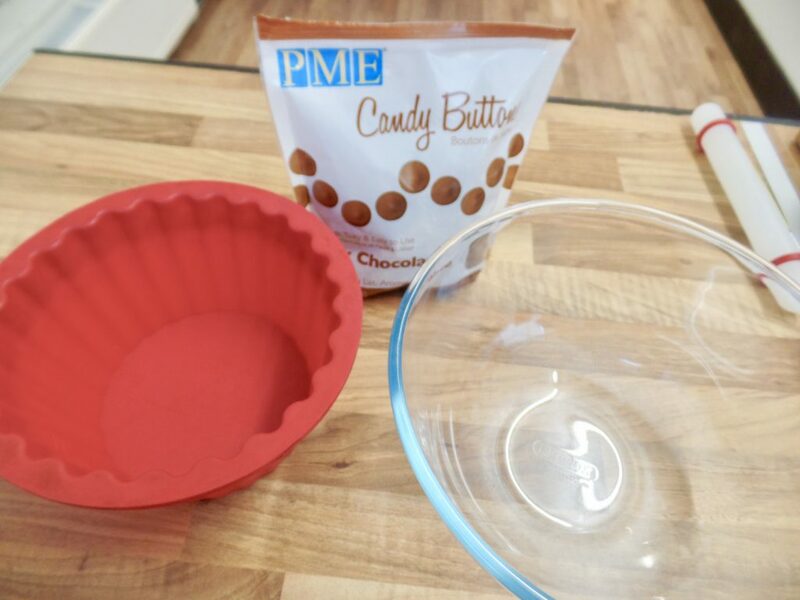 The first thing we are going to do today is make the cupcake shell. I’m using milk chocolate candy buttons, to resemble the trunk of the tree but you can use whatever colour you like. 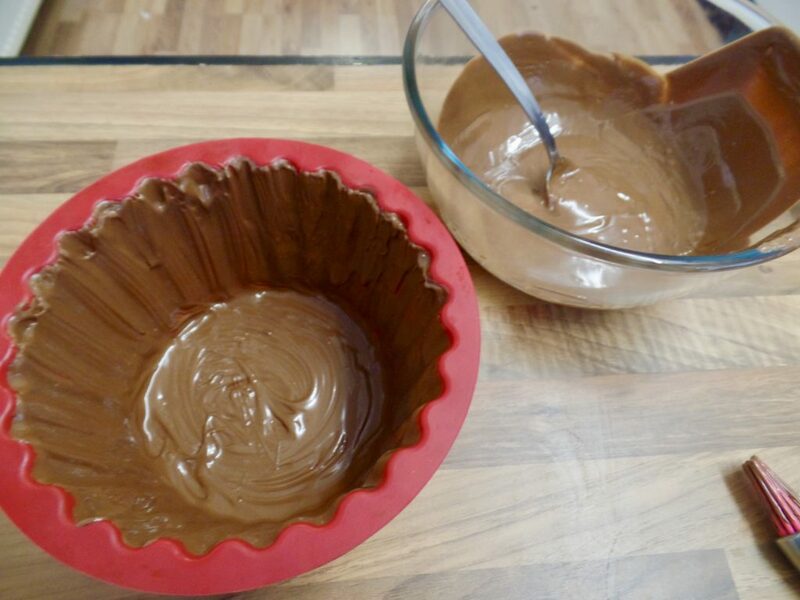 You can also use candy melts or anything similar or milk chocolate instead. 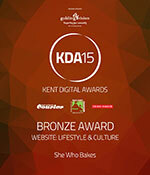 If using chocolate I recommend using good quality Belgian chocolate. I have found that if you use standard chocolate bars, it may crack when you are trying to get it out and it also sometimes melt when you are handling it. 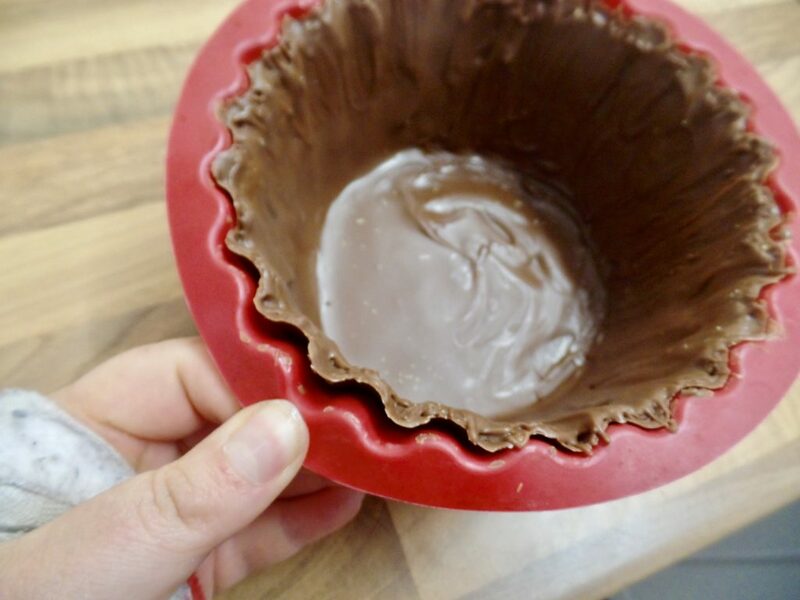 I also advise painting the inside of your mould or tin with a little cake release first before pouring in the chocolate to make it easier to come out. 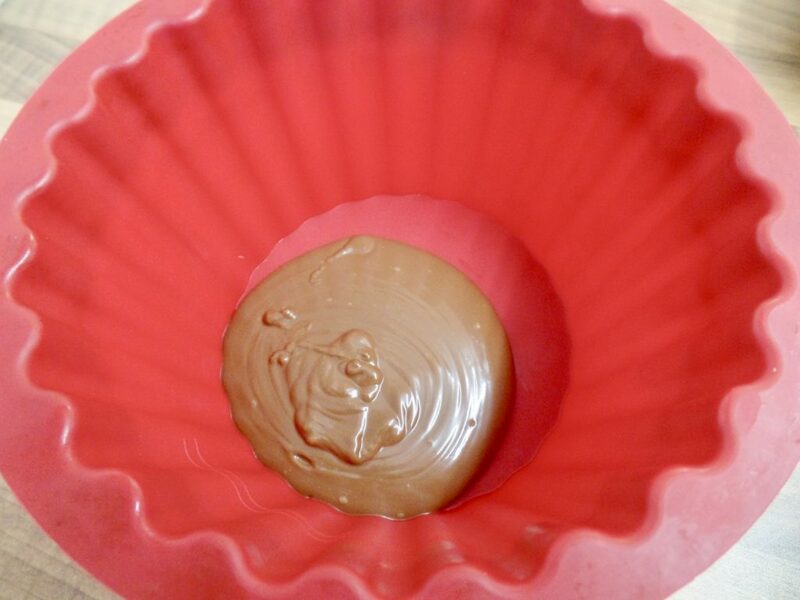 Melt your candy melts/belgian chocolate. Pour half of this into your giant cupcake base. 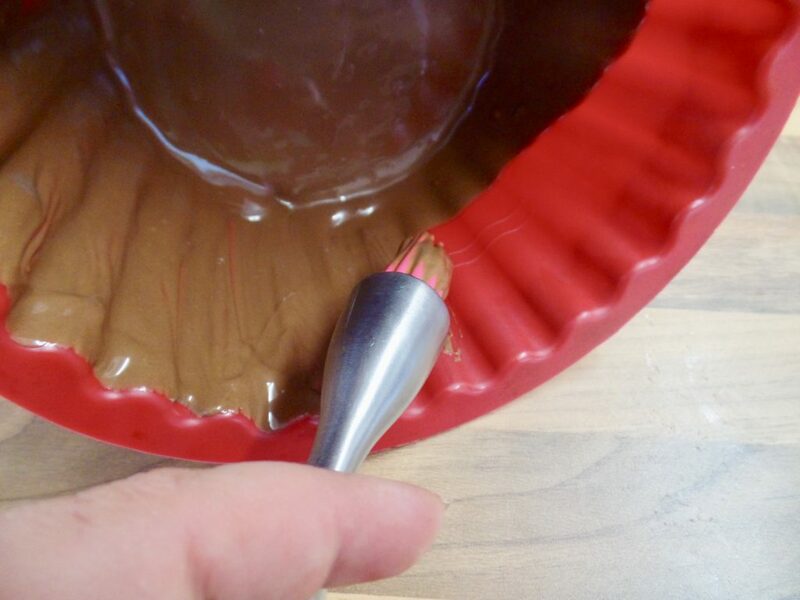 With a silicone brush, paint the candy/belgian chocolate up the sides of the case, being quite quick but firm. Pop it in the fridge to set for twenty minutes or so then take it out and give it a second coat repeating the first few steps. You may need to remelt your candy/chocolate. Put back in the fridge to set for a further twenty minutes. Gently peel the top of the case away from the shell to check it has set. Then go around the shell only releasing the top. Then pull the sides of the base down away from the shell. So now we have our shell and our board and decorations from the day before. Time to put it all together! 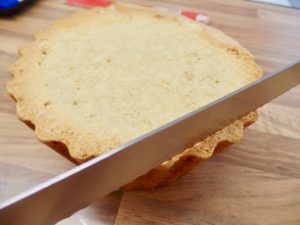 You will first need to level both cakes, using a cake leveller so they sit flat and then you will need to trim the base cake slightly as now the shell is a little thicker thanks to the candy buttons. 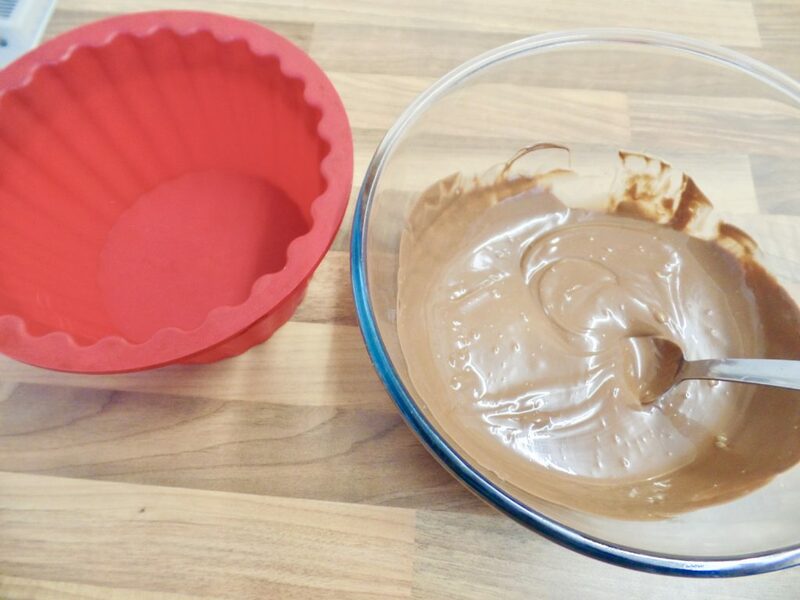 Then, split the base cake in two and fill with whatever filling you would like! 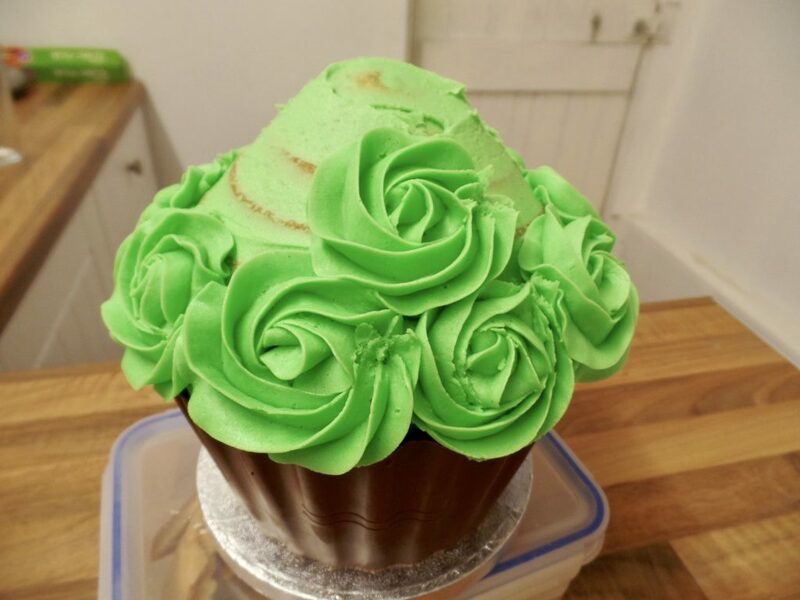 I’m using a vanilla buttercream I’ve coloured green with Sugarflair Party Green, you can find my recipe here. Crumb coat the base cake by spreading a thin layer of buttercream around the outside. 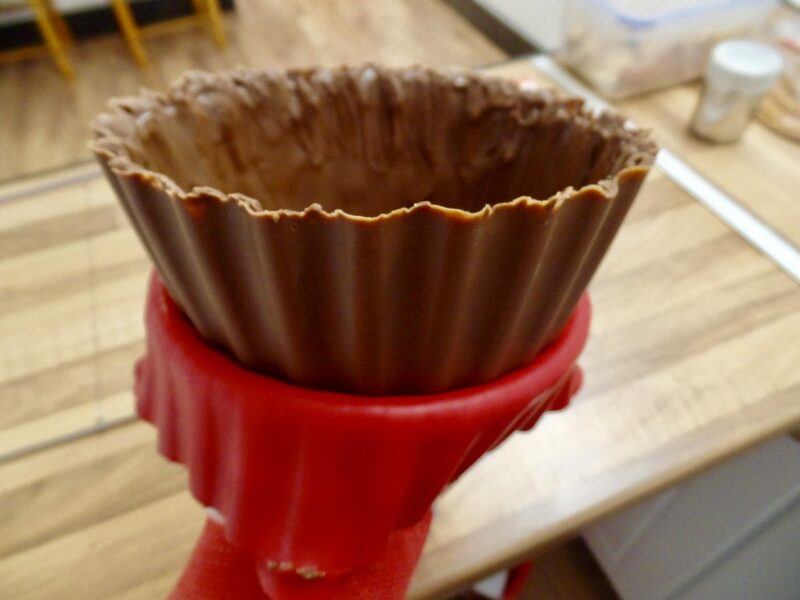 Once set, gently put your base cake into it’s chocolate shell. Spread a little buttercream on top of the base cake. 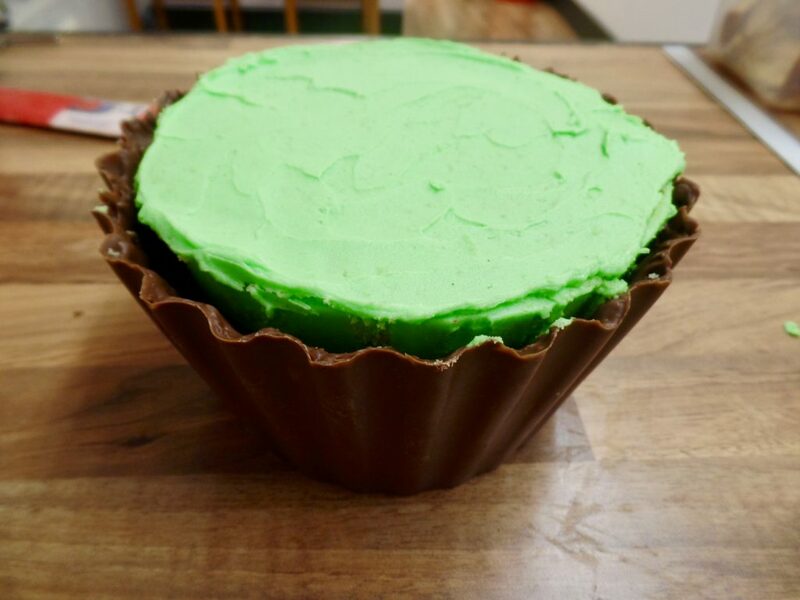 Gently place on the cupcake top. 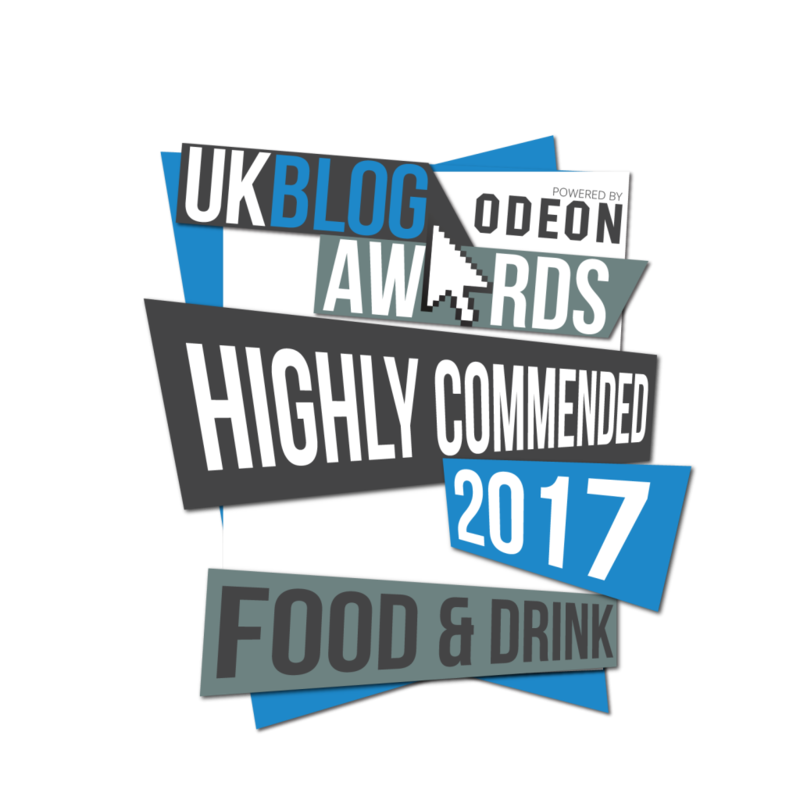 Press down gently but firmly to ensure it is stuck down. 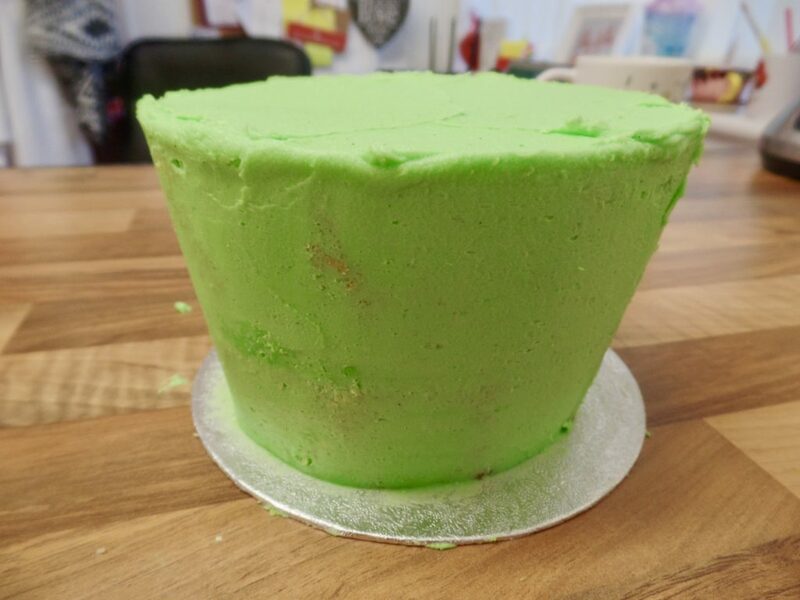 Crumb coat the top of your cake by spreading on a thin layer of green buttercream, this will help your piping to stick and stop any cake from showing through. 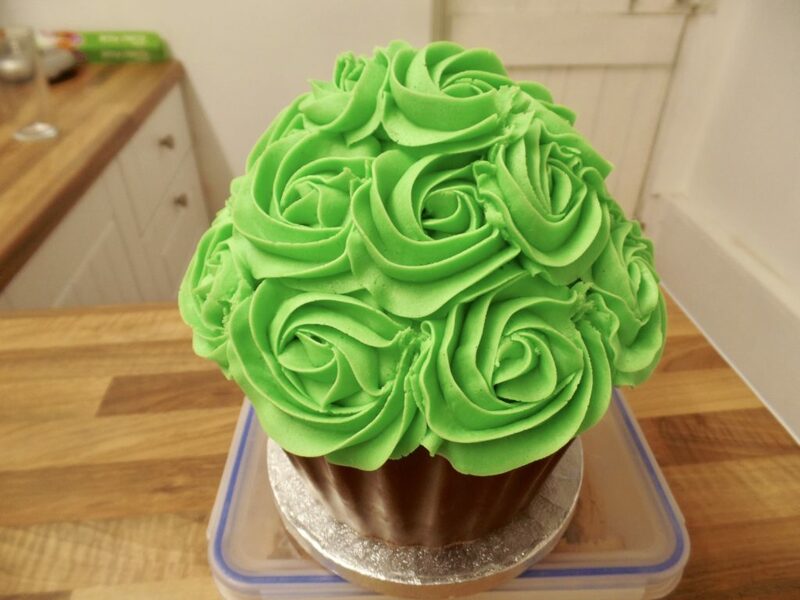 Next, we’ll decorate the top with buttercream swirls. 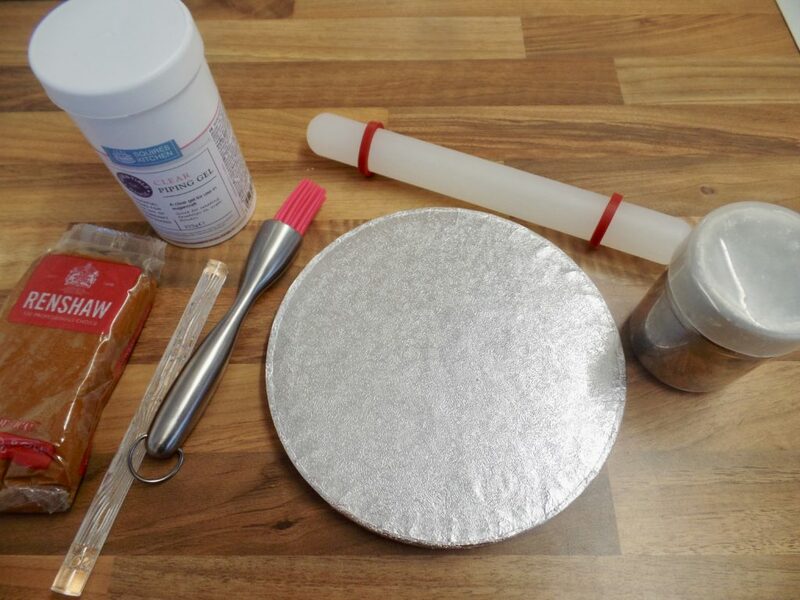 Fit a large piping bag with a nozzle of your choice, I’m using a 2D, and then fill the bag with green buttercream. 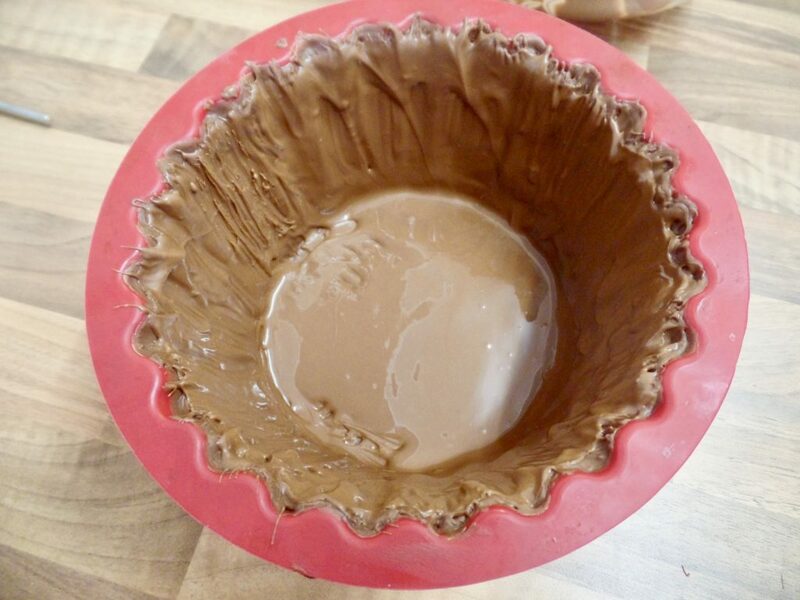 Starting around the base of your cupcake top, pipe swirls starting on the inside and working your way out gently but firmly, making sure to allow a little room between your nozzle and the cake for the design to come out. 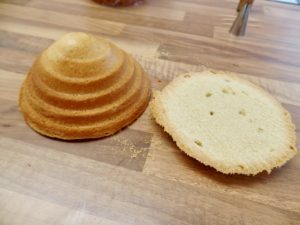 Go around the base of your cupcake top and then in between these on a second layer. 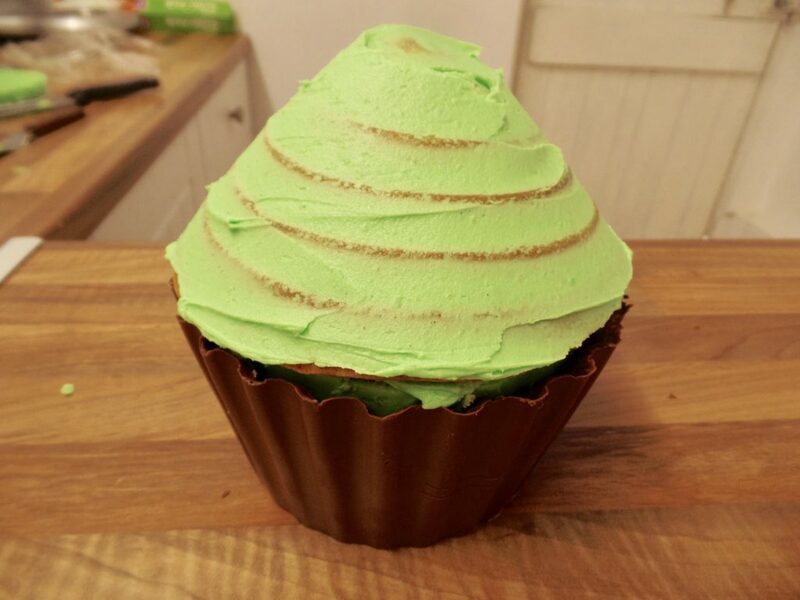 Repeat until you are at the top and then pipe one large swirl on the very top of your cupcake. Pipe small stars in any gaps by squeezing firmly, stopping squeezing and then pulling away. 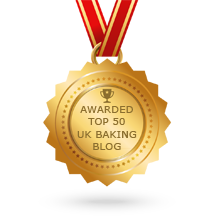 You can find out more about piping on my online Cupcake Course. 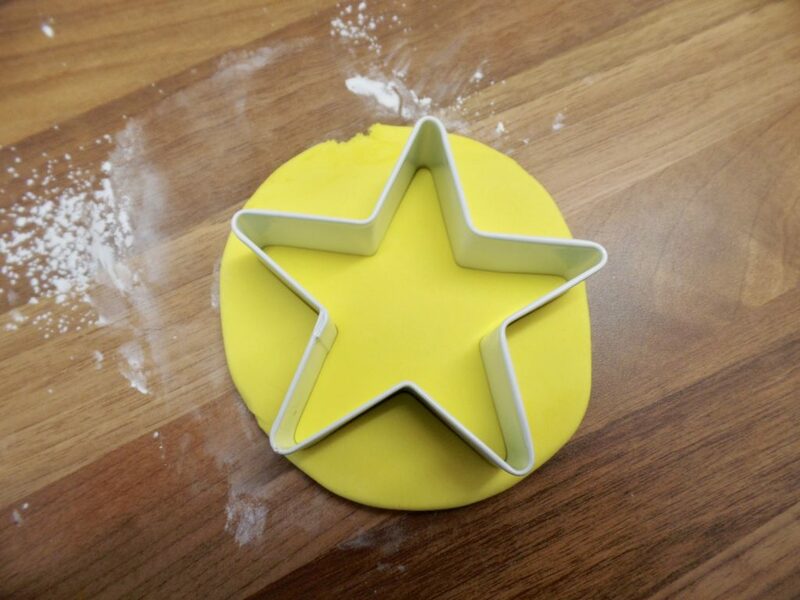 Decorate as desired, placing the large star into the buttercream at the top of your cake and then any other shapes you like. 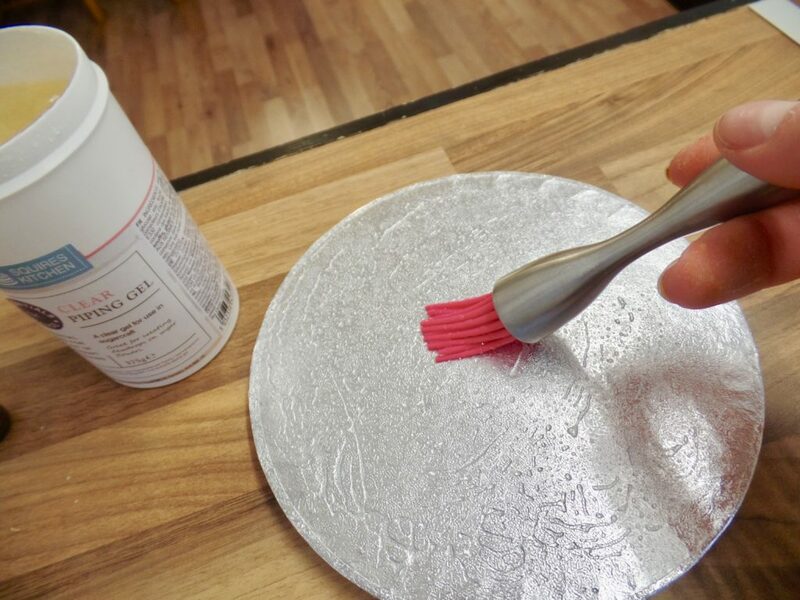 Once decorated, carefully fix your cake onto your iced board using a little buttercream. Leave in a cool dry room until serving! 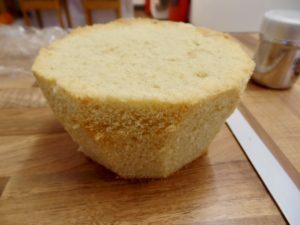 This will last about a week if decorated fully (so no air can get to the sponge!) and then 3 days once cut into if wrapped well in cling film. 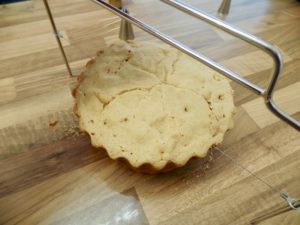 Make sure to not leave it in a room that gets too warm for too long or the buttercream and chocolate casing may start to melt! A perfect centrepiece for your Christmas table and a nice alternative to traditional desserts! 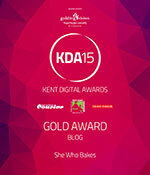 Merry Christmas and happy baking!